A now familiar tale: police kill a black man, and the public erupts into protests and riots. Fringe (libertarian/conservative) media sometimes point out that police actually kill more whites than blacks, and that police are only punished in one out of every 1000 cases of such killings. These data would suggest that the problem is not racism but police. It is also not a new problem, but one that is endemic to many regions infested by police. Nevertheless, liberal media mogul and former Nazi collaborator George Soros has been funding "social justice" campaigns to inflame the public and ensure that the spotlight remains on race and not on the problems of legal monopolies on the use of violence. If you're not in the ultra-rich, politically-protected one-percent-of-the-"one percent", Soros is not your friend. He appears to be using his wealth to get the lower classes to destroy themselves and each other. Astrologically, I find that when race is a public issue, we'll find the Moon, the sign of Cancer, and/or the Fourth House to be highlighted. So here's the chart for the approximate start of yesterday's riot in Baltimore. Transiting Moon and Jupiter conjunct Baltimore South Node and Sun: awareness of race and history expanded. Transiting Moon and Jupiter trine Baltimore Pallas: the Moon trine suggests mobilization for combat and the Jupiter trine suggests that ethics are a part of the public discussion. Transiting North Node conjunct Baltimore Pluto: the stirrings of revolution? 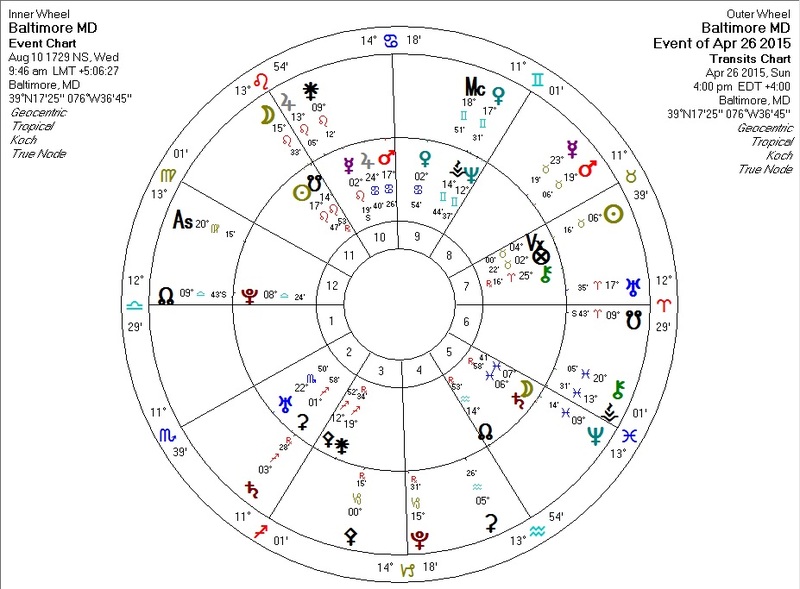 Transiting Pluto at Baltimore IC opposite Baltimore Mars in Cancer, quincunx Baltimore Sun and South Node: if this doesn't say "race riot", nothing does.